WRiTER’s from far and wide, spanning the globe, representing all ages and multiple styles of WRiTING, have gathered here today to witness the inaugural bout of the 2012 version of WRiTE CLUB! Our illustrious WRiTER’s are not only from all walks of life, but they also occupy various levels of the publication world. I’m told by my wife that within our ranks we have everything from newbie bloggers to the recently published. But none of that matters today, because inside the ring they stand as equals. The submissions have been steadily pouring in, so much so that I’ve decided to break one of the rules of WRiTE CLUB and hold two bouts per week. I’ll be hosting new bouts every Monday and Thursday for twelve weeks and the voting for every fight will last one full week. So a you can vote for a Monday battle all the way until midnight on Sunday, and you can vote for a Thursday brawl up until midnight the following Wednesday. “A dragon.” Faith said the word, but the beast towering over them looked nothing like the creatures from her dreams. Lacking scales and muscles, its grotesque form consisted of ligaments, tendons and bone. A pea green flame wove along its frame, fanning out to a thin web upon its unfurled wings. Its body filled the room, enforcing a pressure so intense Faith’s fingernails cut through to the padding beneath the carpet. Her arms trembled, fighting to regain her crouched position. The skeletal dragon craned its neck down, bringing its skull close to the girls. Top points of its wings scraped the ceiling. A whimper escaped Julia’s lips. Faith’s throat constricted. Her heart drummed triple time. Its breath was like a blast of heat, singeing the round tops of Faith’s cheeks. Her ears tingled. Her eyes stuck open, all the moisture sapped away. She forced a dry swallow to free her voice. “You, you, you have the wro-wrong place,” Faith stuttered. One empty eye socket, the size of her head, locked on to her. Not an eyeball to swivel, yet it glared down at her. With godlike speed, it thrust its claws forward, pinning Faith and Julia against the wall. Their feet dangled above the floor. Faith wondered what the beast found so funny. From the corner of her eye, she glimpsed a small chain around Julia’s neck. At the center of her chest rested a piece of silver reflecting the firelight…the shape, a dragon with a round belly. The beast – its words - made sense to Faith, at least part of it. The silver dragon was a locket hand-made by her father, a gift from a time too long ago to remember. What could this thing want with me? She shuddered at a dawning truth. The creature had its sights set on Julia instead. The wrong girl. Her apartment had been invaded, torn apart and set ablaze. Now the very same beast mistook Julia as the girl of dragon chain…and for what, some blasted keys she knew nothing about? A bitter cold swelled deep inside her belly. Her growing anger fueled it into her veins. The chill coursed to her fingertips and the soles of her feet. A violet glow shined between the spaces of the creature’s claw. And it noticed. Faith didn’t know a thing about ejules or tarodes, andreally didn’t care. She opened her mouthto say just that but gasped, realizing she was the source of the glow. Enjoying two talented writers at work is only part of the price of admission, now it’s up to you to decide who moves forward to the playoffs, and who will return to WRiTE another day. In the comments below leave your vote for the winner of round 1. Which one tickled your fancy? Tell all of your friends to stop by, sign up, and make a selection as well. The voting for this round will remain open until noon Sunday. Yes, it’s subjective, but so is the entire publishing world. It’s as much about the readers as it is about the writers. Here in WRiTE CLUB, it’s not about the last man/woman standing, it’s about who knocks the audience out! It’s also not too late if you want to submit something for possible selection in future rounds. 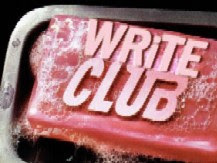 You can enter the fray at anytime during the first twelve rounds by submitting your own 500 word sample and become a full-blown member of WRiTE CLUB. Just check out the rules here…then come out swinging! How do we vote again? Just by commenting? If so, one vote to Ratz. This were both tantalizing pieces! For me, this round goes to ... Ratz! Awesome, two great entries, but my vote goes to Word Whittler! They were both great! My vote goes to Ratz. My vote for this round goes to Word Whittler! YEAH! I'm so excited this is back!!! Although I enjoyed the second piece, my vote goes to RATZ. The first story grabbed my attention more with its dark humor and appropriate ending. Hard decision, as I'm sure all the rounds will be. I'll vote for Ratz. This was super tough. Both pieces were awesome. I vote for Word Whittler. I have a soft spot for dragons, so my vote goes out to Word Whittler. Word Whittler has my vote. Woot! I'm excited that WRiTE CLUB is kicking off!!! Two very captivating pieces to start out this competition with. I compliment both of the authors. Each piece had its merits, but overall, I preferred the one by Ratz a little more. in spite of wishing that the characters had been named and having a few POV slips, I think it flowed better and did a better job of pulling me in. Wow, kicking this off with 2 super entries! I liked them both but my vote goes to Ratz, the ending was perfect. Both were great, and so hard to choose (~bites nails~). My vote goes to Ratz. I thought both of these were great, but my vote goes to Word Whittler. I think Ratz should win this one. I like both, but my vote is for Ratz. It had me hooked from beginning to end, and I love dark contemporary fiction. They were both excellent...I'll go for Ratz, but it was a difficult choice. Argh!!!! So hard. First round and it's already super difficult. Hm. I obviously enjoyed both pieces and tones. My vote goes to Word Whittler - I'd like to see where the story goes. Oh my goodness this is tough. Both are interesting pieces, but think I'm going for Ratz by a whisker on this occasion. Wow, two awesome entries. Both should be proud of their work. Ratz had great dark humor, but my vote goes to Word Whittler. I'd like to read more. During Write Club, I'll personally be looking for pieces which have a full story arc squeezed into the max 500 words. Now, I'll yap about the fighters for this match. I'm a fan of fantasy. Word Whittler chose a difficult piece to cram into the wordcount. It feels like an excerpt from a much larger work. Only one girl encountering the dragon-- written in 1st person--would read stronger and free up some wordcount. In a short piece like this, using undefined terminology ("infernal of Jie lieth", "dragon chain", "ejule", "tarode") keeps the reader at arm's length. Positives: Love the dragon in a contemporary setting (constricted by the confined space of an apartment) & the description of the dragon is excellent. Ratz has submitted an entry that does have the arc I like in flash fiction. That proverbial twist-at-the-end is always a bonus and an element I enjoy in short works. I would have liked to known the names of the characters. Even in flash fiction, a little grounding is needed, and I didn't get a solid feel for the husband/wife arrangement/relationship. Positives: This one has a good bit of voice coming through. Full arc: beginning, middle, end. Twist which leaves the story open-ended. I'm not experienced in judging these at all.. but you voiced what I was thinking to a T. If, inside 500 words, characters can be developed, and conflict and some amount of world building, not to mention a great twist, it'll get my vote. I agree, the reason I voted for Ratz was that it was a full story. Word Whittler's story felt as if it was pulled from a WIP. It felt incomplete. Hey, just so everybody is aware, I'm quoting from a previous post: "It's just a random 500 word flash fiction piece right? It doesn't have to be from a WIP does it? Both are acceptable. It can be a fully contained story, or just an excerpt of a larger piece of work. We are concentrating on the writing style here, not story idea's." Word Whittler (who is not me) is within the parameters of this contest. Of course we are all voting as we see fit using our own metric - each is valid as any other. Battle on! Just reading back through the comments, and after reading these, I'm going to give much the same reply as Heather: While I love a self-contained piece of well-written flash, WRiTE CLUB does not require that the submissions be a complete story. Most of the entries from last year were snippets (usually openings) of what seemed to be longer pieces. If an entry appears to be part of a larger piece, I try to judge it from the perspective of: Does it develop characters, raise story questions, and serve a plot? Most importantly -- does it pull me in and make me want to keep reading more? Of course, everyone's votes are entirely subjective, and I support each voter bringing their own opinions and taste to the competition, but I also hope that no-one judges the entries of WRiTE CLUB too strongly based on a criteria that falls outside of DL's guidelines for the contest. Well, a lovely discussion has sprouted! Yes, both pieces fit within the guidelines for Write Club. No doubt. As my original comment noted: this is my *personal* method for selecting a winner for each round. Closed stories will tend to get my vote if the writing is up to par. With that being said, great writing is great writing. I may very well go with an excerpt over a 'complete' piece if the writing floors me. I am hoping to spell out the reasoning for my decision each round. Once again, these are nothing more than my *personal* opinions. They're meant to give a peek behind the curtain of my vote. Great way to start off Write Club guys! My vote goes to Word Whittler. Okay, I always like to give some feedback with my vote -- and I don't want that to be misconstrued as criticism, but I figure the authors might like to know why I voted the way I did. I was immediately struck by the dark humor of Ratz's vignette, but I was a little turned off by the stereotyped screeching of the wife. Then, when I got to the end and realized it was an entire story in less than 500 words, I thought: Okay then. There wasn't much time for character development, and I like the twist at the end. When I got to Word Whittler, I found the description of the skeletal dragon very intriguing. I especially liked the lines: "One empty eye socket, the size of her head, locked on to her. Not an eyeball to swivel, yet it glared down at her." But overall, I had trouble following the story. I wasn't sure which girl was the POV character until halfway through. I understand this is a scene out of the middle of a manuscript, but there were too many unexplained elements for it to stand alone as an excerpt for me. So, in this round, my vote goes to Ratz. Both were great. I enjoyed the subject matter of the second, but I liked the writing style more for the first. So my vote this round goes to Ratz. They were both wonderful. My vote is for Ratz because I couldn't stop reading and was surprised at the end. Well played! Both are well done, but my vote goes to Ratz. Not a fan of dark themes but the first exhibits honed skill. Another vote for Ratz. It's very nice to see people giving both considered and encouraging feedback. Best of luck to both entries. My vote goes to Ratz. Both pieces were well written, but WW had me a little confused. Ratz has a clear strong voice, but could use a little polishing here and there. Still, I found it to be the piece that held my interest and told a story. My votes goes to Ratz. Both were good but I like the twist of the first one. Vote goes to Ratz. both very good stories! hard to judge different genres! Hamfisted writing can be so divisive. That's the main reason I'm choosing Word Whittler over Ratz, who could've tried to make the characters as clever as the dialogue. My vote goes to Word Whittler. If I had to choose between these two pieces to continue reading, I would stick with Word Whittler longer. My vote goes to Ratz. Caught me by the short hairs right from the start. While the first sentence of Ratz's story caught my attention, I didn't get into it as much as I wanted too. Word Whittler's story was interesting to read all the way to the end of the sample. Word Whittler gets my vote. They were both great, and while I preferred the subject matter in Word Whittlers, I felt Ratz was stronger writing so my vote goes to Ratz. But again, both were great!! I vote for Word Whittler--loved the writing in both, but I loved the feel of the second story more. Word wrote the better tale, but Ratz had the cleanest write, so I vote for Ratz. My vote is for Word Whittler. How can you say "no" to a dragon? I mean, for reals. Both are great entries, but my vote has to go to Word Whittler! Word Whittler gets a vote from me. This was a really tough call. Word Whittler's piece definitely had me more intrigued but I think Ratz's writing was stronger so my vote goes to Ratz. While Ratz's story was more complete and had that nice twist at the end, I found the characterization to be a bit heavy-handed and stereotyped. Word Whittler's piece needs some clarity in terms of POV, but the descriptions and action were well-paced and compelling. My vote goes to Word Whittler. Wahoo, RATZ for the win! That was spectacular! This is tough... they're both very good. I'm going to have to go with Word Whittler just because I dig dragons, so that breaks the tie. Both pieces were good for different reasons, but I'm going with Word Whittler on this one. I am voting for Ratz. Not only is it my genre but loved the twist at the end. Both were great little snippets, but the vivid descriptions, awesome imagery and cliff hanger ending of the second entry is the one that left me wanting to read more. My vote goes to Word Whittler. I vote for Word Whittler. My vote is for RATZ. It definitely filled out those <500 words more efficiently. My vote is for RATZ! What a twist. I have an undying adoration for dragons and love the strong imagery given. I vote for Word Whittler, it had me on the edge despite the slightly confusing narrative, and loved the other wordly feel of the foreign terms. While the first story had a beginning, middle, and end, it was too predictable for me. I'm going to vote for Word Whittler because of the great descriptions. I vote for Ratz. An entire story arc, with a twist ending. Wonderful. While I enjoyed both of these, and found them well written, my vote goes to Word Whittler, as it held my attention, and had me on the edge of my seat, more than Ratz. Both great entries. I liked Ratz' edge. So I vote for Ratz. I'm gonna go with Word Whittler. I'm going with Word Whittler. Wow, what a great start! While I liked both stories, my vote goes for Ratz. My vote goes to Ratz this time around. Two very strong entries! I'm voting for Word Whittler. Normally I don't enjoy dragons (OMG I know, I am the worst) but I LOVED this. I must say, Ratz's first line hooked me straight away! What an intriguing story! So Ratz gets my vote! Crap! Did I miss my chance to enter??? OK, this was hard because these guys are BOTH strong writers... Ugh! OK, I don't normally go for dragons, but I think I'm picking WORD WHITTLER. So different - so good - such great ending moments. Ach! Word Whittler by a hair. Love the writing and the subject. Although I found Word Whittler's piece a little more confusing, it's got my vote; Ratz's piece was a little too one-dimensional for me, although clever and I would say more tightly written. I wouldn't continue to read Ratz's work if it came out of a larger piece - I think someone used the word hamfisted? and I was creeper out by the sudden, intense, uncontextualized violence. But I'd like to read more of WW's, even if I think it could use a bit of tidying; I found the descriptions much more compelling and the idea seemed original. I liked the second story, too, but one vote for Ratz. It's tough, they were so different, but my vote goes to Word Whittler. Holy cow - look at all these votes, D.L.! As I scrolled down and down and down I remembered what I really don't like about WRiTE Club - the voting. It's so hard! These are both great pieces, and it's so difficult to decide. But I'm going to vote for Word Whittler. I agree with other comments that it could use a bit of smoothing, but the imagery and the plot are deliciously intense. Ratz piece is also wonderful, but as someone else commented, maybe a little too one dimensional on the wife's characterization. I'm going to go with Ratz. It was a little unsettling but very well written. The second piece was great too. Ratz gets my vote! The writer plays with dark humour with successful results, and lets the reader come to their own conclusions about the terms of the arrangement between these two equally despicable (delightfully so) characters. Calls to mind characters like "The Twits" or "Mr & Mrs Smith" where there is no real heroic personality and you're not sure who you want to win out in the end. Love it. An earlier voter John Lucas Hargis highlighted my thoughts on Word Whittler's piece - it's not recommended to use unknown terms in a flash fiction medium which doesn't allow room for explanations. I'm sure if all the terminology info was somehow included it would have made more sense. If a writer feels like they really have to include unknown terminology in their flash fiction, limit it to one or two. I love fantasy for the very reason that we readers get to feel that we're a part the world that the writer's mind lives in. Don't leave us behind!